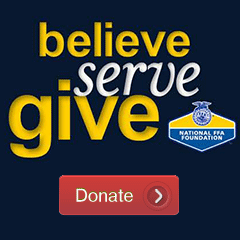 As one of the ten National Days of Service sites at this year’s Convention, 360 FFA members joined National Safe Place, CSX Transportation, City Year, and Dignity U Wear to hold a clothing drive for kids around the country in need of brand-new clothes. “You’ve clearly never been in the shoes of someone with only one pair of clothes, have you?” one young FFA member asked her peer, who was not taking their clothing drive volunteer opportunity seriously. “We’re gonna do this, and we’re gonna do it right,” she told him, as they began their assigned duty of sorting through boxes of men’s pants. This attitude of determination and motivation echoed throughout the opening activity of the National Safe Place session of the National Days of Service celebration. A record high 1,500 FFA members will participate in this year’s National Days of Service, held at ten different sites throughout the 86th National FFA Convention & Expo. National Safe Place is based out of Louisville, where it was started by Larry Wooldridge 30 years ago. Wooldridge ran a shelter, but knew that a lot of kids in need were unable to access it. He partnered with kid-safe community businesses, now known as safe places, where kids in crisis could go for help and supportive resources. Wooldridge saw it as “a model we could replicate in other communities,” and it now reaches over 1,500 communities, explained Laurie Jackson, President and CEO of National Safe Place. A National Safe Place (as well as National FFA) supporter, CSX Transportation collaborated with City Year, a non-profit that provides targeted student interventions, and Dignity U Wear, an organization that provides brand new clothing to children in need. “The National FFA Convention in Louisville has been a perfect opportunity to bring these organizations together,” said Jackson. Each organization played an important role. National FFA was looking for service opportunities while in Louisville. Dignity U Wear provided 80,000 articles of clothing, City Year was able to organize the opportunity and CSX was able to provide a location for FFA members to organize boxes of clothing and transport them. Finally, National Safe Place will distribute the clothing to shelters. On Monday, October 28, FFA Delegates helped to set up the service event. Then, for two days during convention, four shifts of eighty students prepared clothing packages for shipment to National Safe Places in Florida and Connecticut. Becca Harrison is a former member of Cobleskill-Richmondville FFA chapter in NY. She is currently a senior at Cornell University, studying animal science & international agriculture. Her studies have taken her from India to the White House, & you can follow her adventures on Twitter @_beccaharrison.